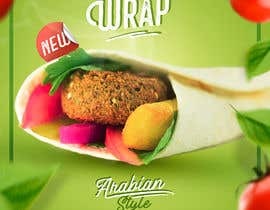 We are quick served restaurant serving premium quality food would like to make graphic design for our new vegetarian product Falafel Wrap in different sizes like square size for Instagram, A5 flyer, A0 poster and roll up. The design need to reflect and emphasise that this product for vegetarian food lovers. If you could please give some feedback! Thank you very much. Dears, please note that I have updated the contest details and added dropbox links that contain Falafel Wrap picture that need to be used in the design as well as number of graphic designs that reflect our theme and style. Hey, I did the art, thanks for the invitation! But Im wondering whats the right name. In the contest details, its been typed as Flafel, Falafel and Flafel. In the pictures they are written as Flafel, so I decided to use this name. Is it correct? I have went through your dropbox files, I couldn't see a clear design pattern. You have different designs for different purposes, if I'm not wrong. I suggest that you provide some design examples, please. Feedback is very helpful also.